Catch this video – the first of its kind, and a must watch before you start cooking! Chef Philippe Parola’s TV Show, Tips from the Pros, reveals Chef Philippe’s unique Asian carp de-boning technique, with former student Chef Cullen Lord and special guest Gary Tilyou. Asian carp have been farmed in China for over 1,000 years, serving as an ancient food staple throughout Asia. Asian carp were brought to the United Sates in the 60s and 70s for use in government agency and academic research, and in sewage treatment plants; and as a biological control for algae, plants and snails in aquaculture. 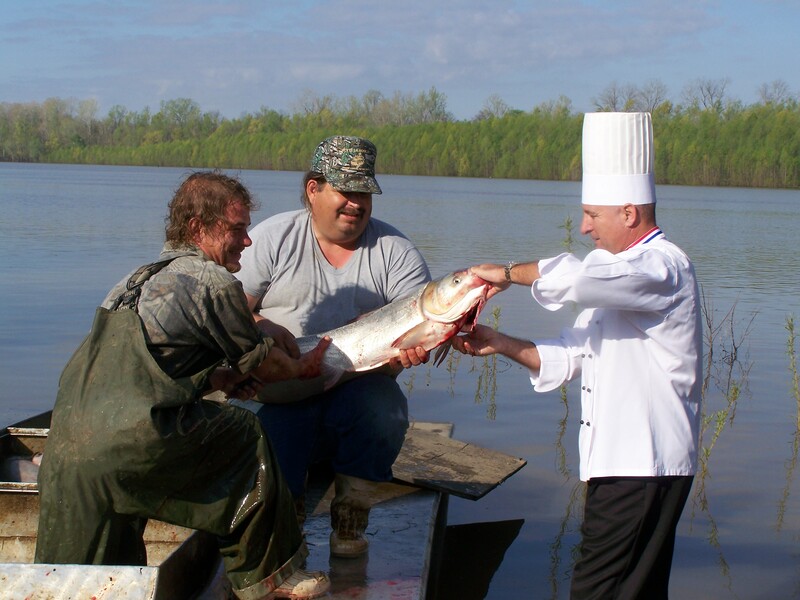 The spread of Asian carp into the Mississippi River Basin is likely the result of insufficient controls to contain the fish in the ponds when conducting research. The flooding of the 70s and 90s furthered the invasion. Ever since, they have been running rampant through the basin for decades. With no natural predators and a voracious appetite for plankton, these invaders are out-competing native fish, striking fear as they approach aquatic ecosystems. Several species of Asian carp exist, but Silver carp is the most notorious – as a menace and as a jumper when boat motors roar! Weighing up to 80 pounds, a collision can cause serious human injury. Silver (and bighead) carp are filter feeders which renders their white meat delicious, but makes traditional angler methods inadequate. Net and bow fishing are better bets for getting your catch – or you can just wait for them to jump in your boat! Preheat grill to 400 degrees, and treat grill surface with non-stick spray. Create the marinade. In a large plastic bowl combine soy sauce, water, brown sugar, Sriracha sauce, garlic, ginger, and sesame oil. Whisk thoroughly. Marinate the fish. Add fillets to marinade (making sure each fillet is evenly coated) and refrigerate overnight. Make the kabobs. Thread the fillets on soaked wooden or bamboo skewers. Place the kabobs on the barbecue grill, and cook 3 to 4 minutes on each side (or until done). A special thank you to author and ecologist Corinne Duncan for her content contributions to the Asian carp Introduction. Preheat the oven to 350°F. Crack both eggs into a bowl to make egg wash. Beat well. Add half & half and mix well. Dip silverfish strips into egg wash then coat in seasoned flour. Fry until golden brown. Serve with Pickapeppa mango sauce. Poach or steam silverfish steaks until fully cooked. Break steaks into small pieces and remove bones. Place meat into mixing bowl, and add butter, mustard, egg and lemon juice. Mix well. 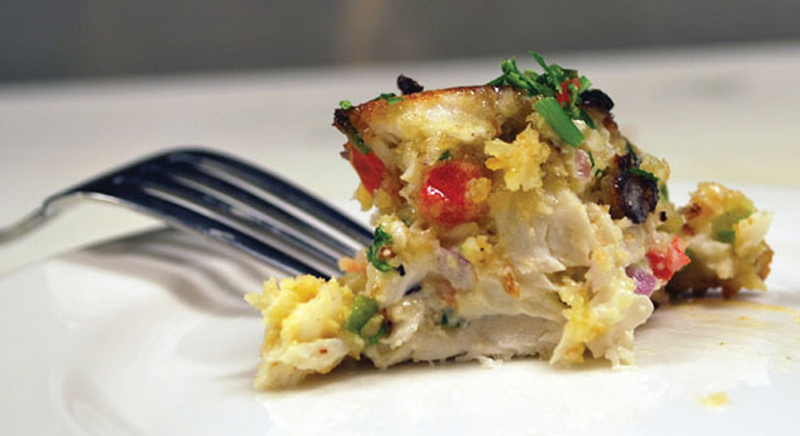 Add bread crumbs and season to taste. Pat into small cakes and dip into egg wash, then roll in seasoned flour. Fry 4 to 5 minutes until golden brown. 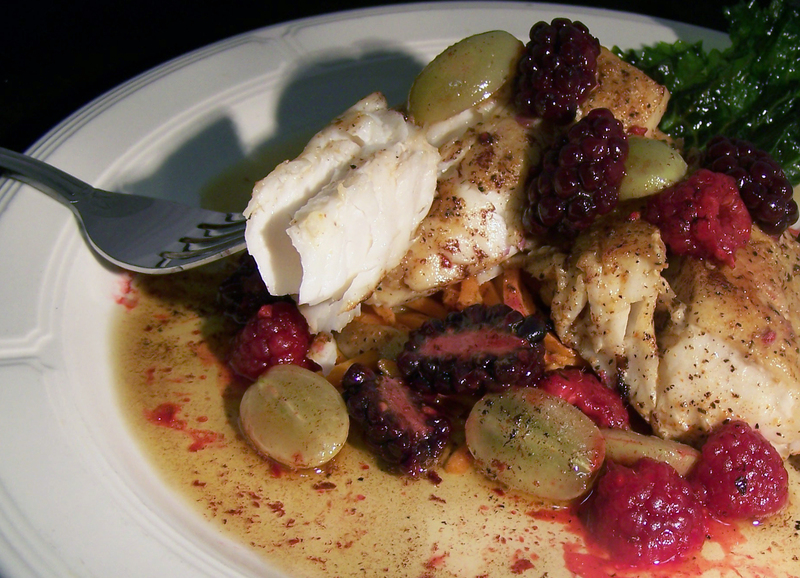 Serve with beurre blanc or lemon butter sauce. Preheat oven to 350°F. In a skillet, preheat olive oil and butter until very hot (but do not burn butter). Place seasoned silverfin steaks in the skillet and brown both sides. Add white wine and lemon juice. Place steaks with sauce in baking pan. Bake at 350°F for 10 minutes. 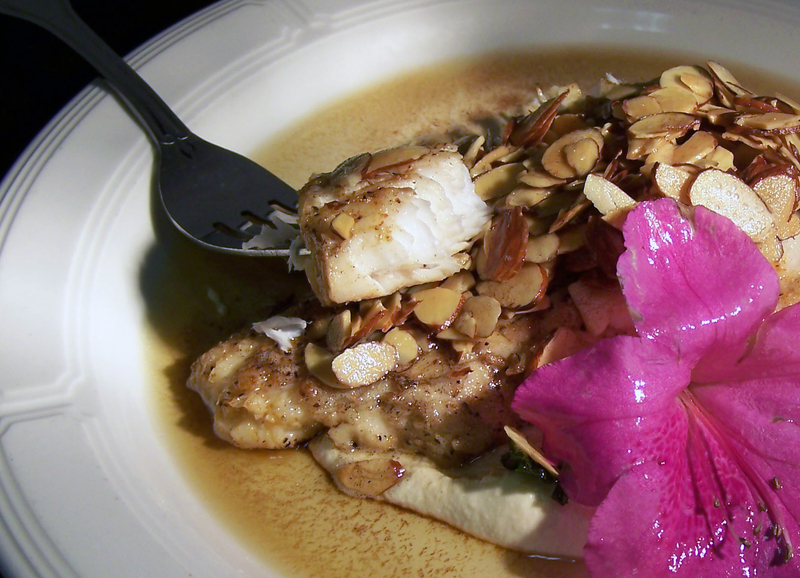 Serve topped with roasted almonds. Preheat oven to 325°F. In a skillet, preheat olive oil and butter until very hot (but do not burn butter). Place seasoned silverfin steaks in the skillet and brown both sides. Add white wine and both lemon and orange juice. Bring to a boil then place steaks with sauce in baking pan. Add berries and bake at 325°F for 12 minutes. Serve topped with sauce and berries. Check out this video featuring Dr. Quinton Phelps, Fisheries Biologist for the Missouri Department of Conservation, providing helpful tips on filleting Asian carp. Preheat cast-iron skillet with oil to 375 degrees. Combine fish coating and cajun seasoning in a gallon-sized zip-close bag. Drop each fillet into the fish coating mixture and shake bag. Place the fillets into the hot skillet (do not overcrowd). Cook 4 to 5 minutes until crispy and golden brown (should flake easily with a fork). Place cooked fillets on paper towel lined plate.